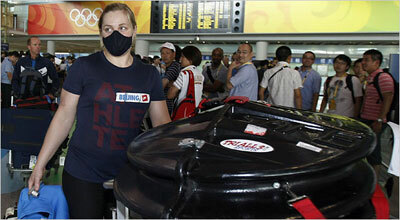 USA Cycling Athletes arrived in Beijing wearing facemasks and causing controversy. Yes, they could’ve took those off for the greeting line and then back on, but there’s irony that a country obsessed with “face” (I wrote about that yesterday), has athletes covering theirs. I expect long commentary about the masks. One upside of the Beijing Olympics and air quality is the anticipation of new, breakthrough asthma medications for people like myself. The IOC has said there was no reason for alarm. Its medical commission chief, Arne Ljungqvist, said the air quality did not pose problems to athletes or visitors unless they had a specific condition such as asthma. Returning from China, it normally takes about a week to clear your lungs and nose and the air is absolutely going to affect performances. Athletes are going to discover that they do have asthma, trigged by the air. The NYTimes just published an essay on running in the air. While in Beijing, we joked about the 37 flavors of fuel – at 00:46. In the news coverage, the woman with the mask on is local Seattle track star, Jennie Reed. NYTimes reports on the mask incident. Previous Previous post: The new Campagnolo Ergopower shape: Good or Bad?